A spacious main hall, with many options for accommodation, is also ready to host guests for large-scale events. The mood of the room is set by rich colors of paintings and light background music. "White" room is perfect for small banquets. The design of the VIP-hall is made in the style of "Provence", bearing a spirit of simplicity and comfort. Light pastel colors of walls and furniture, sunlight pouring from panoramic windows, create an easy and truly homely atmosphere. The English room is a great place for a closed business conversation. Muffled light, noble color of walls and soft leather English sofas with low backs - all this contributes to a measured rest with a philosophical character. Try delicious Mediterranean, Italian and French cuisine! At your choice, the latest trends and time-honored classics of cooking. And the firm's recipes from the chef will not leave anyone indifferent. • High-tech heat treatment of sous-vide products. • Outward meals "Fire show". • Large selection of salads with a variety of options for dressings based on sesame, olive, vegetable oils and sauces based on mayonnaise. • Beautiful serving of dishes using molecular cuisine. Come, try, be surprised and enjoy the unique taste of our dishes! We accept cards: Visa, Master Card, Maestro, American Express. 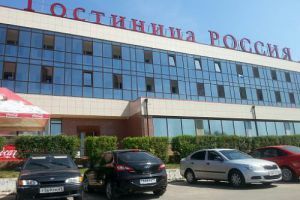 Two star hotel AMAKS "Russia" is located on the very bank of the river Volkhov near Yaroslav Dvorishche is located. The hotel has single, double and triple rooms. From the rooms overlooking the embankment, you have a beautiful view of the Volkhov River and the Novgorod Kremlin. In the afternoon the hotel has a restaurant, and in the evening you can spend time in the bar or on the outdoor terrace. Opposite the hotel there are free parking spaces. According to historians, earlier on the site of the hotel was the oldest settlement of people. Not far from the hotel is the Gostiny Dvor (the place of ancient Torg), as well as the Yaroslavovo Dvorishche. Those wishing to visit the Kremlin will have to make a pedestrian walk along the pedestrian bridge across the Volkhov River. The hotel is convenient for travelers with its good location, as many attractions are within walking distance of it. 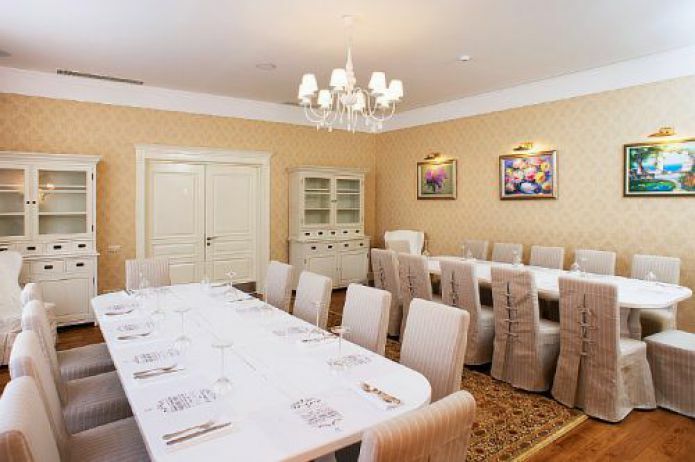 The hotel is located on the right bank of the Volkhov River in the park area, and from the windows of the hall of the building guests can watch a stunning view of the Volkhov. Free Wi-Fi is available throughout the hotel, as well as in the rooms. The price includes breakfast, as well as a visit to the swimming pool and saunas. 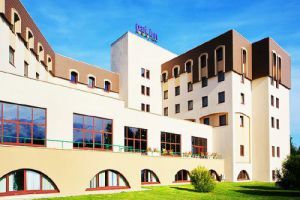 The hotel has 226 modern rooms, which are divided into five categories. 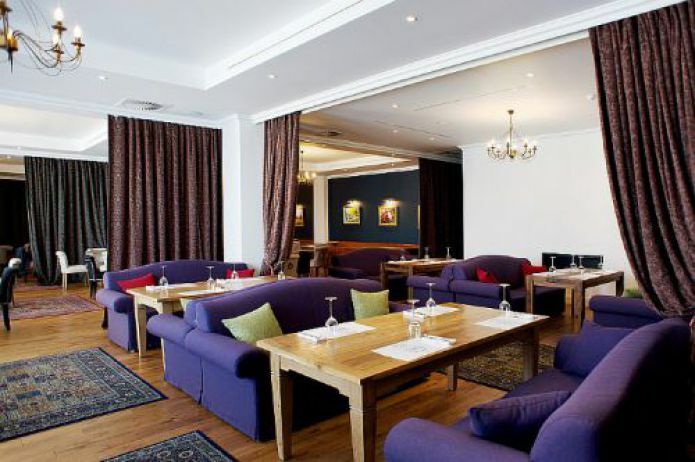 Hotel Park Inn by Radisson - Veliky Novgorod also offers guests and residents of the city additional services. • The main restaurant of the Hotel Gallery - the restaurant has two banquet halls with a total simultaneous capacity for 250 people - This is a universal venue for celebrations and events. • Lobby bar - Here guests can relax in an informal atmosphere to watch sports and other programs on the big screen, as well as enjoy snacks and drinks. • Restaurant "On the Sun" - Cozy and a place with a summer mood. • For business guests, the hotel has a specially equipped conference room with a capacity for up to 200 people, as well as meeting rooms. • In the BerestaSPA-center guests can use the Jacuzzi, Russian steam room, swimming pool, sauna, hammam, massage procedures, solarium, hairdresser's services, make-up artist's services, as well as a full range of cosmetology and SPA-procedures. 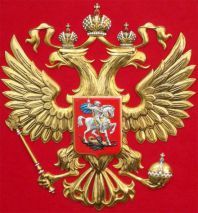 Officinal name of the country – Russian Federation. Along with other former republics, Russia is the assignee of the USSR. Russia has ancient and rich history, but only during Peter I rule at 1721 it was named as Russian Empire. The National Flag of the Russian Federation on a rectangular canvas there are 3 horizontal stripes. Blazon looks like a red rectangular shield with rounded bottom corners. Heads of eagles have crowns, and one big crown is located at the middle above them. In hands of eagle there are symbols of royalty. At the right hand-scepter. At the left hand-orb. Russia has the biggest area in the world. Russia has an area of 17 125 187 km2. Russian Federation can be compared in size only with some continent. Population - 143 666 931 human (information of 2014 ) Russian Federation is a multinational country. There are about 180 different folks in Russia. Moscow is main political and administrative city of Russian Federation. Moscow is autonomous subject of federation in status of a federal important city. Russia has richest cultural heritage and a century-old history. Country attracts travelers from all around the world with its monuments of history, architecture and culture. Perhaps every city has places that could be interesting for a traveler. Lots of Russian sights are included to UNESCO list. Moscow is a tourist centre. City is famous all around the world for its Red square, The Cathedral of St. Basil the Blessed, monument to Minin and Pozharsky, mausoleum. Also tourists are attracted by The Annunciation Cathedral, the Faceted Chamber, the Assumption Cathedral and, of course, the Archangel Cathedral with burials of Russian princes and kings etc. Also tourists are usually exited by sights of Saint-Petersburg. Central part of the second Russian capital has such sights as : Palace Square with the Winter Palace, in which the famous Hermitage Museum functions. The most famous churches and cathedrals of St. Petersburg: Nikolsky, Kazan, Spas-on-Blood, Isaakievsky, Alexander Nevsky Lavra. Tourists also visit: Russian Museum, Kunstkamera, Pushkin Museum and others. Also St-Petersburg is famous for its adjustable bridges and «White» nights. Every visitor of Russia has to see cities of a Golden Ring. All those cities present unique example of ancient Slav culture and architecture. This rout also shows tourists with a huge amount of churches and monasteries. To Karelian republic tourists are going for its famous outside museum on island Kizhi. Here you can see unique churches that don’t look as classical ones. At Volgograd tourists give their attention to memorial complex «Mamaev Kurgan» with its monument – Motherland and panorama of Stalingrad battle. Arkhangelsk is famous for its museums of native art, carpenters and art. Pinezhskiy reserve museum-reserve on Solovetskiy Islands of the White Sea is located near Arkhangelsk. Often tourists that are found of mountain climbing visit mountain Elbrus. On the area of Russia there are more than 100 reserves and national parks with beautiful views. Its always pleasures to visit Russian cities because of cordiality and extraordinary affability of the local population. I was struck with its beauty by the village Vitoslavlitsy, a real village of the 16th-19th centuries under the open sky. The snow-white churches amazed with their beauty, especially in Veliky Novgorod, the ancient Kremlin is impressive. Copying of texts, photos and other information for re-publication on other resources is allowed only with the written permission of the site administration.